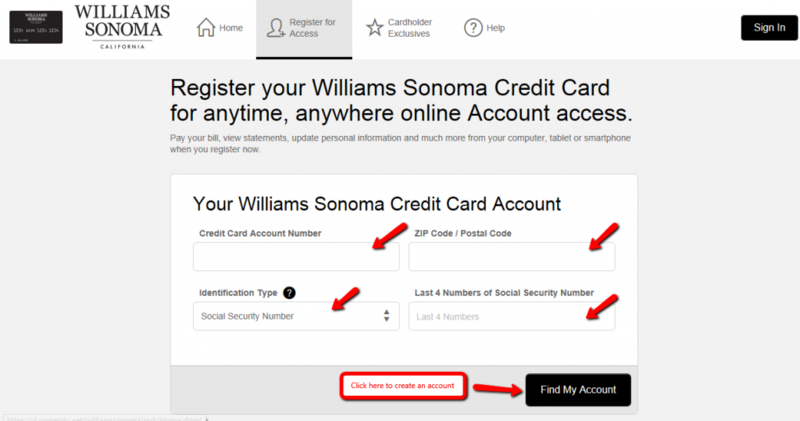 You can securely and easily login to your Williams-Sonoma account online to make payments. If you have lost your password or username, follow the instructions below on how to recover it. If you do not have an account with Williams-Sonoma as yet, go to their website and follow the steps in the last section of this page. Go to the Williams-Sonoma website and enter your username and password in the blocks provided. Then click the black button that reads ‘Sign In’ near the bottom of the page on the left. Once logged in, you can pay your outstanding account balance online. Do not worry if you have forgotten your username or password, just follow the instructions to easily recover both! Go to the Williams-Sonoma website and click on the black highlighted text that reads ‘Forgot your username or password?’ underneath the ‘Remember me’ section. You should be taken to the page below. Once here, enter in all the required blocks with your details and then click the black button on the bottom of the page that reads ‘Find my account’. 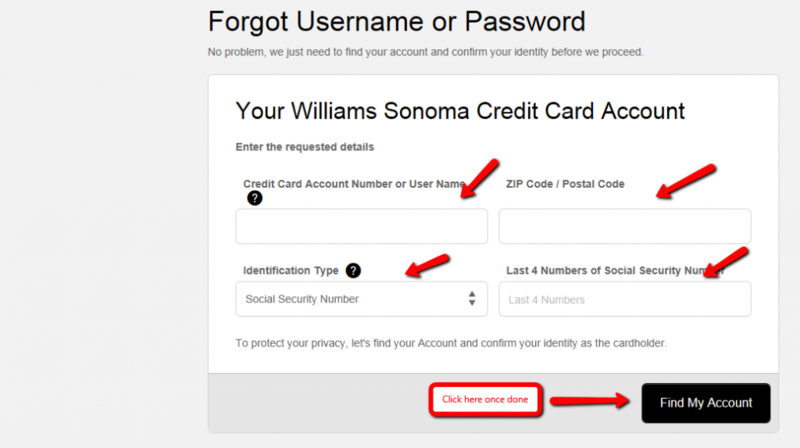 Follow the steps below, using the screenshots as guidelines, to register and activate an account with Williams-Sonoma. You should be taken to the following page below. Enter in all necessary details and then click the black button that reads ‘Find my account’ to register for online access. Williams-Sonoma, Inc. is an American retail company that sells wide array of in-home and in-store services. It is headquartered in San Francisco, California, United States and it is largest e-commerce retailer in the U.S. The company was founded in 1956 and nowadays it has more than 600 retail stores internationally under various brands including Pottery Barn, Pottery Barn Kids, PBteen, Williams-Sonoma, Williams-Sonoma Home, West Elm, Mark and Graham, and Rejuvenation in North America, Australia, the Middle East, and the United Kingdom. Q: How does a reward program function? The reward program gives you the chance that every time you earn $25 in rewards, you will receive a $25 certificate which can be used at Williams Sonoma stores or website. Reward Certificates are issued in $25 increments with your billing statement and they expire after 90 days of issuance. This program is provided by Comenity Bank which may change the terms of the Program at any time. Q: What benefits does the owner of the Williams Sonoma Credit Card get? There are numerous benefits, but the most attractive ones are 5% back in Rewards for every $1 spent at Williams Sonoma. This means that every time you earn $25 in Rewards, you will receive a $25 certificate to spend at Williams Sonoma. Some additional benefits are 20% off your first purchase, Free Standard Shipping, $20 Welcome Certificate, $25 Birthday Certificate and more. Plus, once you apply for Williams Sonoma Visa Credit Card, the benefits are even greater.